Never has the conclusion of an Extreme Sailing Series season been so uncertain, so nailbiting, but The Wave, Muscat, held their nerve to win the final event in Rio de Janeiro and with it, overall victory in the 2012 Series. The most closely contested finish ever in the six-year history of the Extreme Sailing Series, saw The Wave, Muscat clinch the regatta by Janeiro by the smallest of margins – just 0.2 points ahead of the Pierre Pennec steered Groupe Edmond de Rothschild. A shell shocked Leigh McMillan, the skipper of The Wave, Muscat, said this was the most nerve-wracking conclusion to any season of the Extreme Sailing Series. “We’ve had some lucky moments at times, but thanks to the guys around me, they always keep me in good shape, keep me looking forwards at the next opportunity.” The start of the final double-points race in Rio was just such an example. “Just before the start we saw some big gusts coming down the right-hand side of the course, so we set up to start by the committee boat. But then the breeze shut down, and it looked like it was all over for us.” After starting dead last, The Wave, Muscat sniffed out some new breeze and within two minutes was back up in the top three. In terms of the season points, coming into the final event in Rio, The Wave, Muscat crew of Leigh McMillan, Ed Smyth, Hannah Mills, Peter Greenhalgh and Hashim Al Rashidi held a comfortable but not decisive lead, having won three events so far this season. In theory they just had to play it safe and finish sixth or above but this was not the team's style. "We want to fight all the way to the end," McMillan stressed before the Rio event start. But the battle was for second place in Rio and in true Extreme Sailing Series style it came down to the final double points race. With only one point between each of the first three teams and any of the top four teams still capable of winning the event, the implications for the Series podium were huge, and so the tactics were simple – everyone was out for the win. 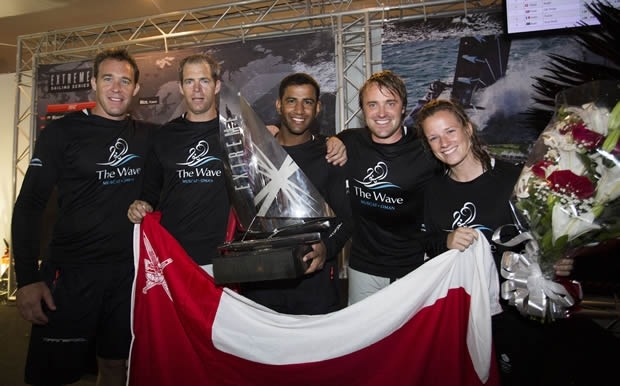 It wasn't clear until the final minute which would get the result they sought: One minute, Austrian Red Bull Sailing Team led, the next Groupe Edmond de Rothschild and in a blink it could be an Omani boat. In the end it was Pierre Pennec who finished the regatta on a high, winning the final race, bringing his tally in Rio up to an impressive 10 race wins, securing his French team second place in Rio and third place in the 2012 championship. “Despite a slight sense of disappointment Rio has been a great Act. It was very close between the top boats, but we sailed well as a team. We fought well and it was a great competition,” commented Pennec after racing. But third place was enough secure Morgan Larson and his Oman Air crew second place in the Series, following their wins in Muscat, Oman and Cardiff UK. Oman Air climbed up to third place on the Rio podium in the dying moments of the final race. Morgan Larson’s team were vying with Red Bull Sailing Team, which at one point in the final race was looking like it might even take victory in Rio. But the fickle wind continued to play its cruel tricks on Guanabara Bay and Roman Hagara's team faded badly on the final lap. So The Wave, Muscat and Oman Air, both boats from the Oman Sail stable have scored the double, the first time a team has achieved this. While The Wave, Muscat contract continues for another year, Oman Air's finishes at the end of this season and at present it isn't clear how many boats Oman Sail will field for the 2013 season. The Extreme Sailing Series is set to return to Rio for the next three years as the world’s eyes continue to watch the build up to the 2014 FIFA World Cup final and the 2016 Olympic Games. The sixth year of the Extreme Sailing Series closes after 209 races staged across seven venues and 11 months of global touring this year. The 2013 Series begins in Muscat, Oman on 5 March with 8 teams (6 returning and 2 new) set to fight for ultimate victory. After four years on the Extreme Sailing Series the French Groupe Edmond de Rothschild team will not be on the start line in 2013, choosing to focus their efforts on their offshore programme. General Manager of Groupe Edmond de Rothschild, Cyril Dardashti said: “I’d really like to thank and congratulate the OC Sport team for all their hard work, their professionalism and the calibre of the different stages of this World Tour. Our absence from next year’s Extreme Sailing Series doesn’t mean that we won’t return to the circuit at a later date”. The 2013 venues and dates will be announced before the end of the year, with eight venues, across three continents making it the third consecutive year of truly global touring for the pioneering Stadium Sailing circuit. The final team line up will be announced at the Dusseldorf Boat Show on 20 January.